Imagine that the barbell curl came with an auto-correct function, one that instantly perfected your form - no cheating allowed. Yes, you would possibly have to remove some weight. But you'd also slash your injury risk while giving your targeted muscles the maximum challenge. As a result, you'd reap the greatest possible benefit from every set. Turns out, that an auto-correct feature already exists - you just have to choose the right moves. I first learned about these moves, known as "self limiting exercises", from Gray Cook, a personal trainer, whose analysis of human movement patterns is used to enhance his clients' performance and prevent injuries. Cook notes that barefoot running is a self-limiting exercise: if you don't use proper form or aren't in shape to run, the pain in your feet is your body's way of warning you to stop before you injure yourself. Makes sense. WHY IT'S SELF-LIMITING: You're relying on your upper body's weakest link to pull yourself up. If your upper back, arms, grip or core aren't up to the task, they simply won't allow you to complete another rep.
HOW TO DO IT: Attach TRX suspension straps to a chin-up bar so the handles are about 1.2m above the floor. Hold a handle in each hand and lie beneath them. Your arms should be straight and your body should be aligned from ankles to head. Brace your core and glutes. This is the starting position. Squeeze your shoulder blades together, pull your upper arms down and bend your elbows to row your body upward. Pause, and then lower yourself to the starting position. HOW TO DO IT: Stand with your left leg on a bench that's about knee height. Your right leg should hang off the side, with your ankle flexed so your toes are higher than your heel. Hold your arms straight out in front of you for balance. This is the starting position. Balance on your left foot as you bend your left knee and push your hips back until your right heel touches the floor. Pause, and push yourself up to the starting position. Finish your left leg reps before repeating with your right. WHY IT'S SELF-LIMITING: If your core or arms tire, you won't be able to hold the weight overhead - it will fall to one side or you'll drop it. HOW TO DO IT: With a kettlebell in your right hand, stand with your feet shoulder-width apart and your toes pointed slightly left. Hold the weight straight above your right shoulder, your left arm at your side. This is the starting position. Keeping your right arm straight, right leg stiff and eyes on the kettlebell, lower your torso to the left, bending your left knee and lowering your left hand until it touches the floor. Return to the starting position. Finish your left side reps, and repeat to your right. WHY IT'S SELF-LIMITING: You have no choice but to keep your torso erect throughout the exercise - if you start to lean forward, that means your core is tiring and you run the risk of falling flat on your face. HOW TO DO IT: Hold a dumbbell vertically in front of your chest with both hands, cupping the weight by the head (the "goblet hold"). Keep your torso upright and your elbows pointed down. This is the starting position. Take one step forward with your left leg and lower yourself until your left knee is bent 90-degrees. Pause, and then push yourself back to the starting position. Complete the left leg reps called for in your workout, and then repeat the move with your right leg. WHY IT'S SELF-LIMITING: If your grip, arm or core tires, you won't be able to push through the lift by overcompensating with any other muscle group; you'll need all three. HOW TO DO IT: Grasp a heavy kettlebell in your right hand and swing it upward until it's next to your shoulder, with your elbow bent and your wrist straight. The weight should be upside down, with the bottom of the kettlebell facing the ceiling. (You'll have to balance it.) Keep your torso braced and upright. This is the starting position. Press the kettlebell up until your arm is completely straight, and then lower it back to the starting position. That's one rep. Finish your right arm reps before repeating the move with your left arm. WHY IT'S SELF-LIMITING: The challenge is that you have to stay completely upright as you perform this movement. If your core tires, you'll start leaning towards the side holding the dumbbell, creating uncomfortable torque on your spine that will force you to stop the exercise. Or if you lose your grip, you'll drop the weight. 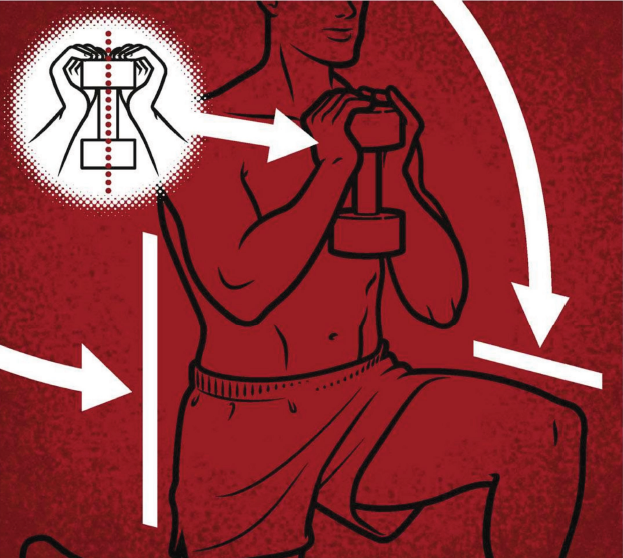 HOW TO DO IT: With a heavy dumbbell in one hand, let both arms hang naturally at your sides. Keeping your torso braced and upright throughout the exercise, walk forward for as long as possible before you have to drop the weight. Shift the weight to your opposite hand and repeat. If you can walk for longer than 60 seconds, switch to a heavier dumbbell.